PURINA® PROPLAN® VETERINARY DIETS Feline HA St/Ox Hypoallergenic is a complete hypoallergenic veterinary diet for the diagnosis and management of food allergies in cats of all ages, including kittens. Some cats may suffer from food allergy, which can cause skin discomfort and/or digestive upsets. 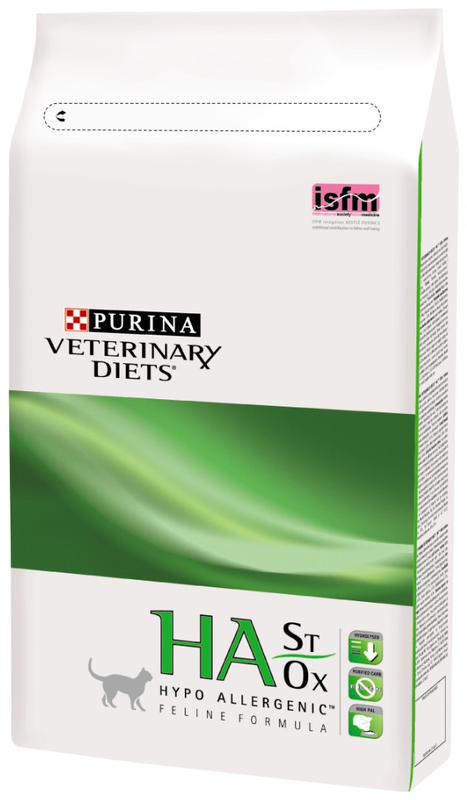 PPVD HA is a true hypoallergenic diet formulated with protein that has been broken down (hydrolysed) into very tiny components that are too small to cause an allergic reaction, and a purified carbohydrate source. Such hydrolysed diets are recognised as the best type of food to use during an 'elimination diet trial' when trying to diagnose (or rule out) food allergy. During such a trial it is important that your cat is fed no other food or treats. PPVD HA is also useful for cats with severe bowel disease such as IBD as it is highly digestible. A great taste thanks to high quality ingredients and a palatability booster. Hydrolysed soya protein*, Rice starch**, soyabean oil, minerals, hydrolysed digest*, animal fat, fish oil. Below are some recent questions we've received regarding Purina Pro Plan Veterinary Diets Feline HA Hypoallergenic Cat Food, including answers from our team. Can you please give me a full list of ingredients. My cat is allergic to chicken in particular. Thank you. It is quite an unusual looking diet with a very pale kibble, but dose work extremely well and is a very popular and effective diet for dogs with dietary allergies, whatever their cause.